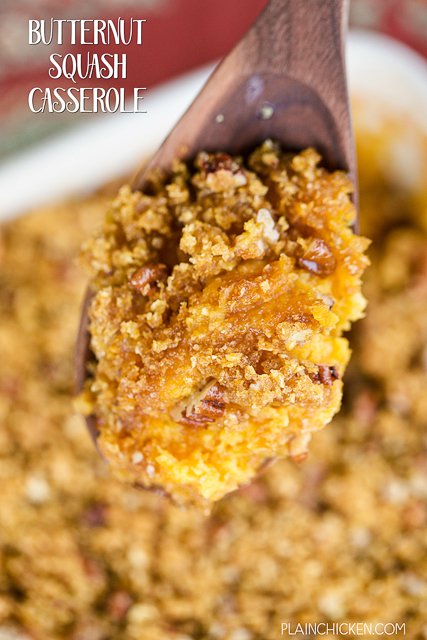 Butternut Squash Casserole - the crunchy topping makes the dish! SO delicious!! Butternut squash, eggs, sugar, butter, milk, coconut, ginger topped with cornflakes, brown sugar, pecans and butter. AMAZING! Perfect side dish for your holiday meals. My Mom absolutely LOVES butternut squash, so I wanted to work on a butternut squash recipe for our upcoming holiday meals. I searched my cookbooks for a good recipe and found a few that I liked. I took my favorite parts of each recipe and came up with this one. OMG! SO good!! 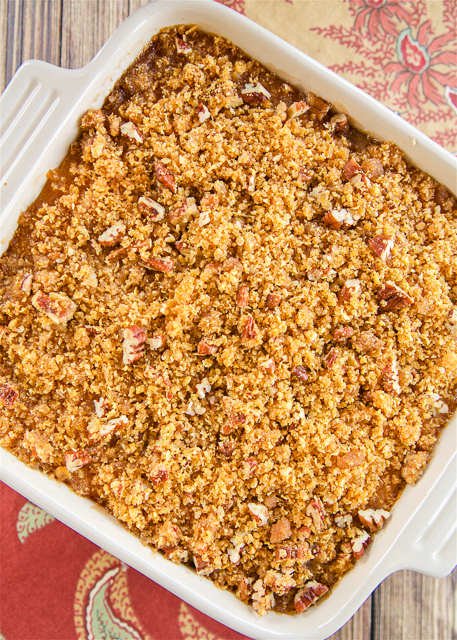 It is very similar to a sweet potato casserole, but with butternut squash. We loved it! I especially loved the crunchy topping. I want to coat everything in the crunchy topping - cornflakes, brown sugar, pecans and butter. WOW! This recipe uses 2 cups of mashed butternut squash. You can cook the butternut squash a few ways - boil it, bake it or even cook it in the slow cooker! I like to throw the whole butternut squash in the slow cooker and let it cook on LOW for 6 to 8 hours. Once it has been cooked, you can easily cut it up and scoop out the flesh. You could do this a few days ahead of your meal and refrigerated the mashed squash. If you prefer to boil the squash, peel it, chop it up and boil it for about 15 to 20 minutes until soft. You can also bake the squash. Cut the squash in half, discard the seeds, and bake at 350 for about an hour. Preheat oven to 350ºF. Lightly spray an 8x8-inch pan with cooking spray. Combine squash, eggs, 3/4 cup sugar, 1/3 cup softened butter, milk, ginger and coconut flavoring. Pour into prepared pan. Combine cornflakes, brown sugar, chopped pecans and 2 Tbsp melted butter. Set aside. Bake casserole for 35 minutes. Remove from oven and sprinkle with cornflake mixture (you might have some leftover). Return to oven and bake for an additional 10 minutes.